It has been more than two years since we have been to Fishing With Dynamite mostly because of the location. My brother has been wanting to try this place specially for their crab cake for a while now. Since he was in town for my birthday, he treated us to brunch. As usual he was over ordering and I had to stop him. What was very refreshing was as our waitress heard me telling him about ordering too much, she suggested we get two crab cakes rather than three. Service was very professional unlike the night before at Ink. 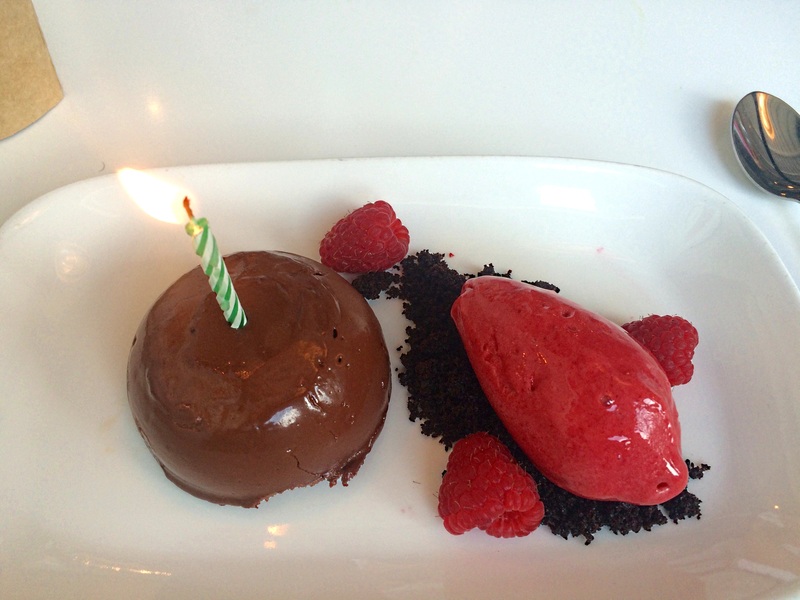 My brother told our waitress about my birthday dinner the night before and she not only wished me a happy birthday but when we received our dessert there was a candle also. Very touching; Other restaurant should learn that little things like that leaves a pleasant memory. My brother loves his oyster and both the oyster and the scallops were sweet and very fresh. A great start. He also loves his ceviche and enjoyed his selection. 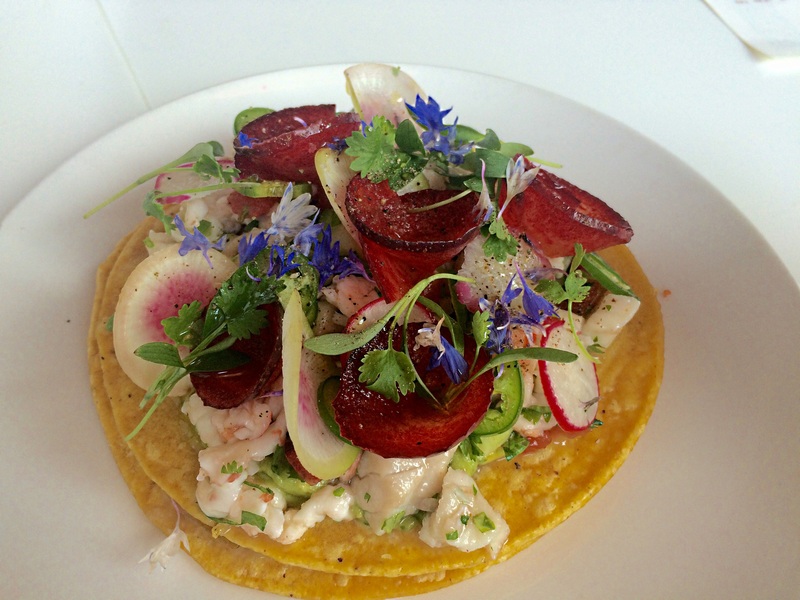 The ceviche was visually beautiful and tasted pretty good. We specially liked the plum touch. The main reason we were here and thankfully the crab cake tasted as great as two years ago. 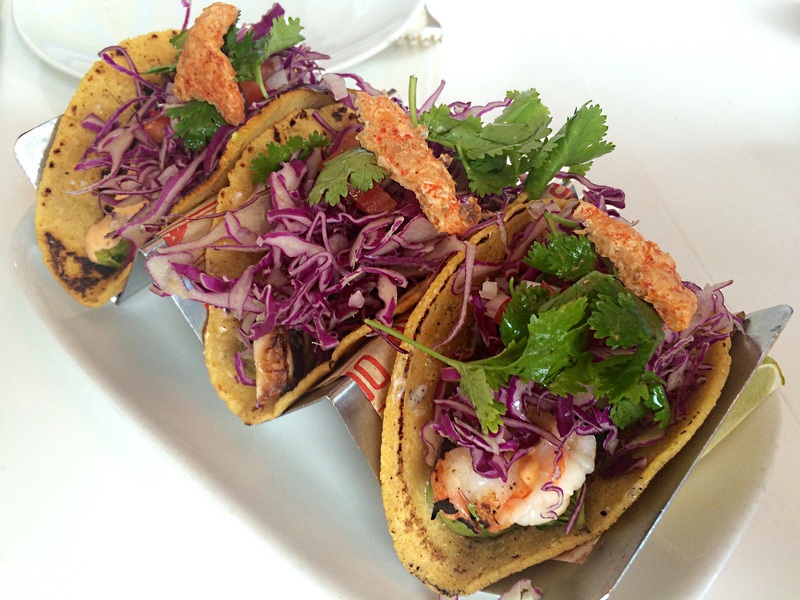 My husband and brother had the yellowtail tacos and I had the shrimp one. This was our least favorite dish. It was your typical tacos and nothing unique about it. 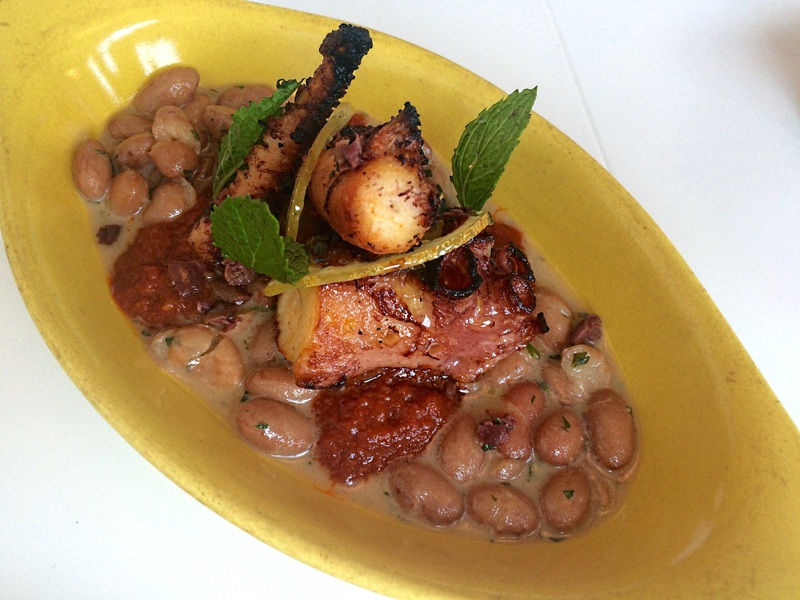 The octopus had a great char, but I didn’t care for the sweet beans. We finished with high marks. Our waitress assured me the chocolate mousse was a dark one and she was right. The raspberry sorbet almost tasted like my favorite one from Grom. We loved this place so much or should I say, the Crab Cake was calling our names, that we had to return here to get more of their delicious food. We started with their Farro salad and this salad had all our favorite ingredients. 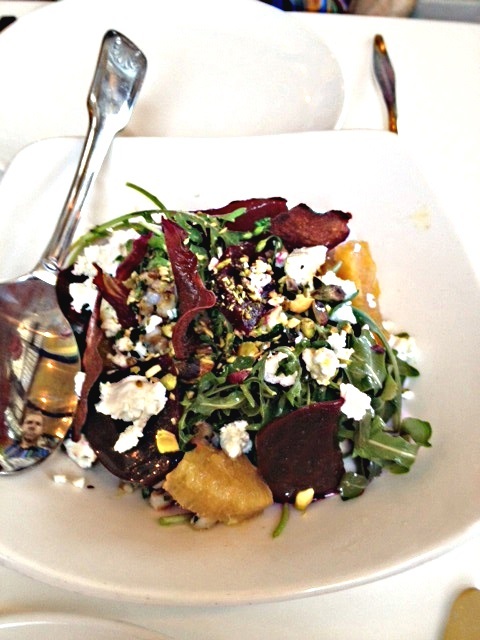 My husband loves beets and I love the other ones, specially feta, orange and pistachio. It was a refreshing salad and a reasonable price at $7. 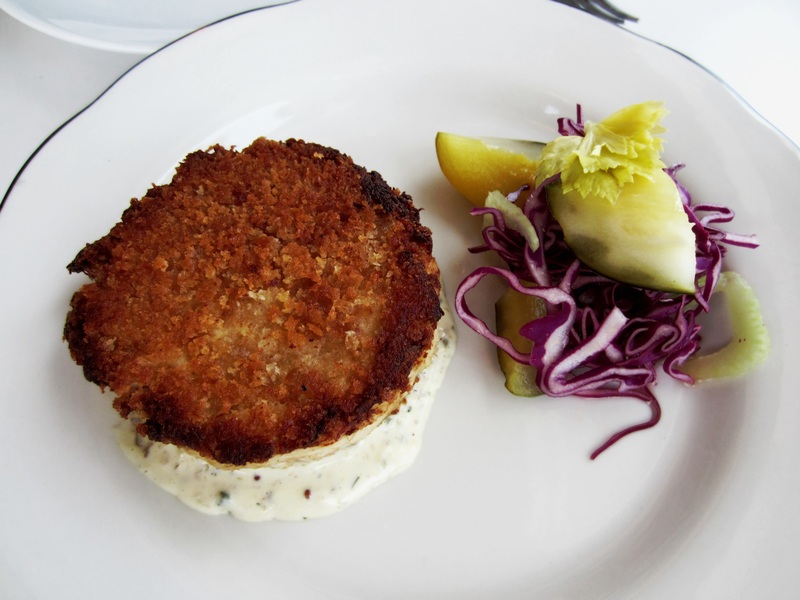 We then each had the star of the show, the crab cake. It was as scrumptious as before and I ate it very slowly so I could savor the moment. Our final dish was the fish tacos. 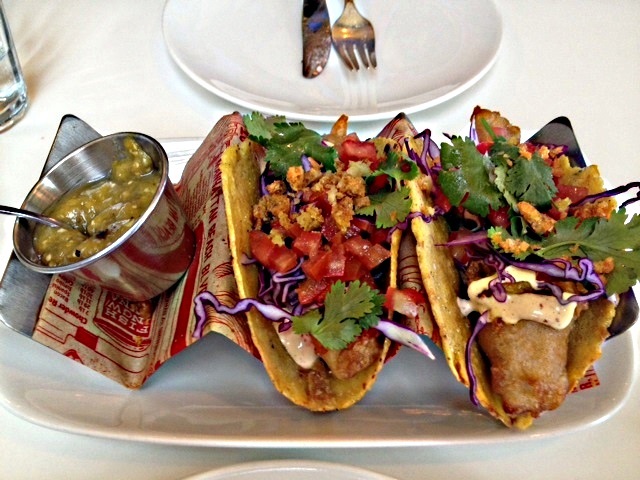 we thought this was the best fish tacos we have had. Fresh fish fried in a light batter with cilantro, cabbage, tomatoes and mint. Mint was the unexpected surprise and it elevated this fish tacos to the next level. Great meal and service. 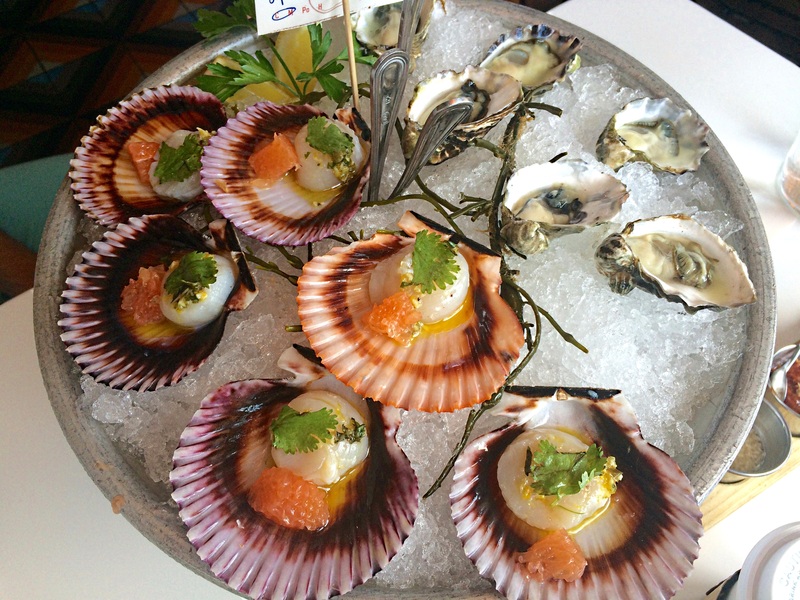 We were excited to finally try a new seafood place in Manhattan Beach by Chef David LeFevre. We had been to his other restaurant, Manhattan Beach Post, previously. FWD was really small and Chef David LeFevre was busy preparing the seafood plates and towers. 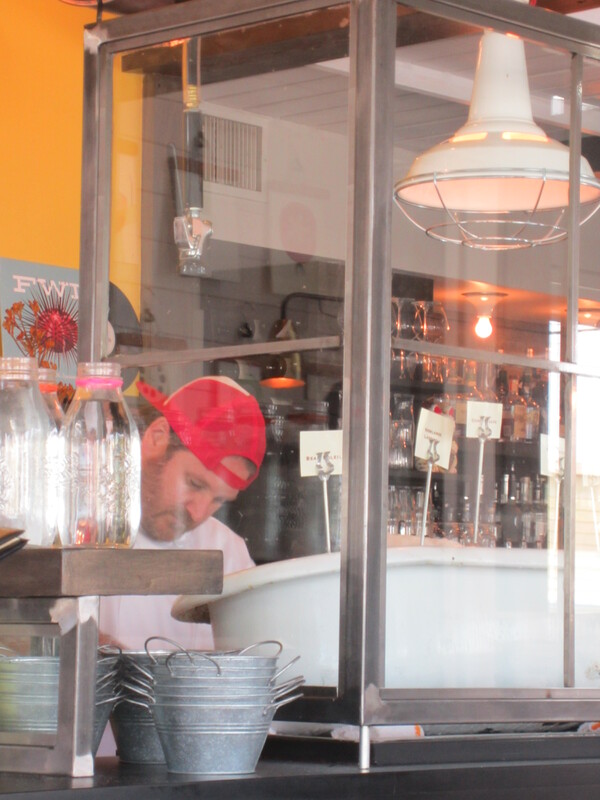 Their menu was divided into raw section, Oysters, platters, old school, new school and after school(dessert). We started with Chef David’s mom’s Cape Cod Squash rolls with Rosemary butter. It was a great start and very tasty. 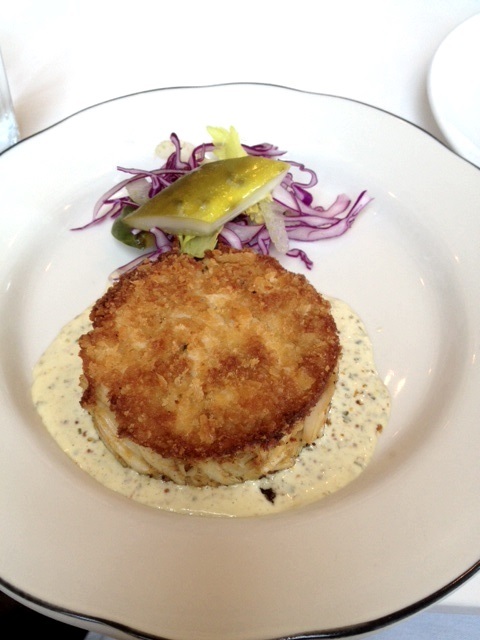 We then had the most delicious Crab Cake we have had in a while. It was all lump Crab meat without any filler. 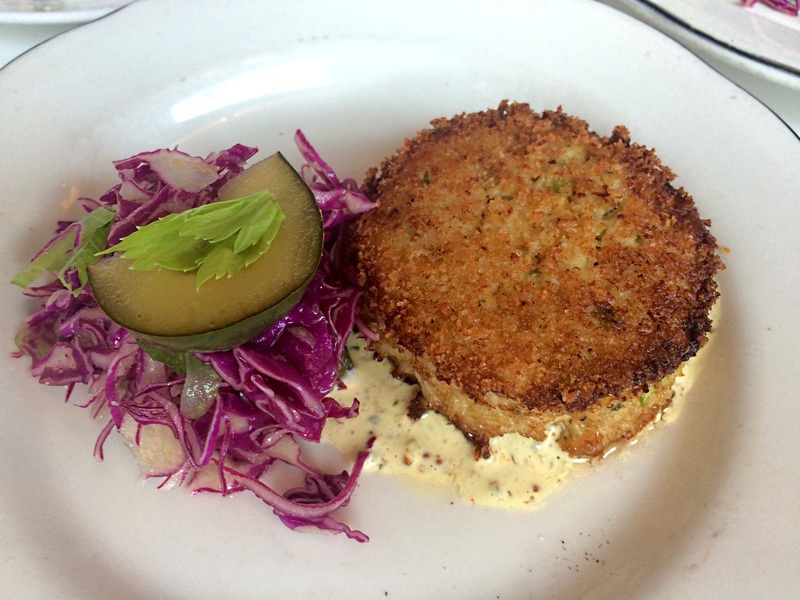 The mustard remoulade and house-made pickles added a great tasty balance to this wonderful dish. Let’s just say I can eat a few of this every day. 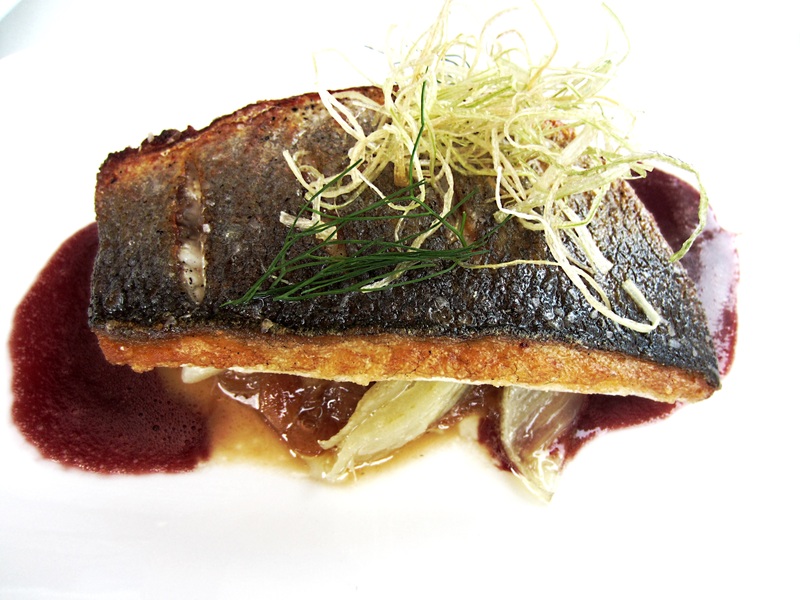 Next was the Loup de Mer with Fennel and Red Wine reduction. It was a very flavorful dish. Our final dish was the Black Miso Cod. 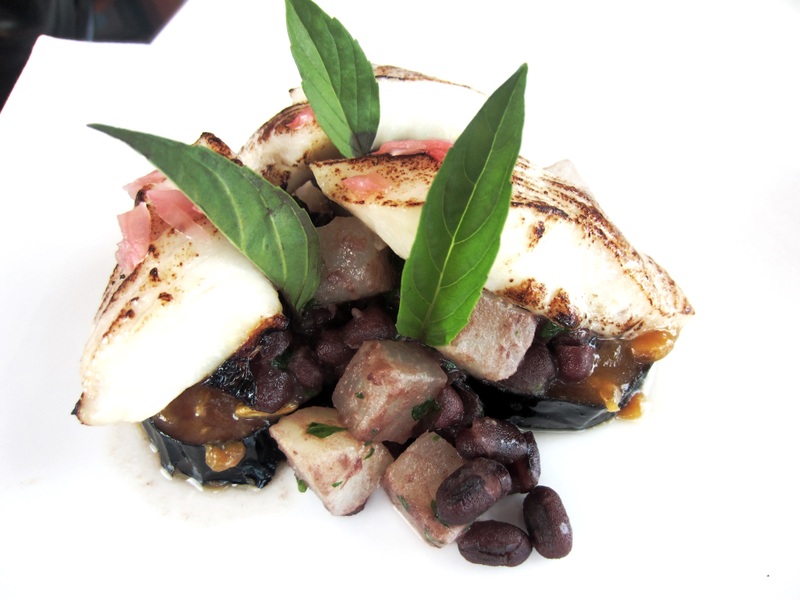 It came with eggplant and Adzuki beans. It was good, but not as great as the other dishes. I guess I like more bold flavors. Overall, a great lunch and wished this restaurant was closer to us.